Traditional wide board oak hardwood flooring which is supplied unfinished for on site sanding and sealing. 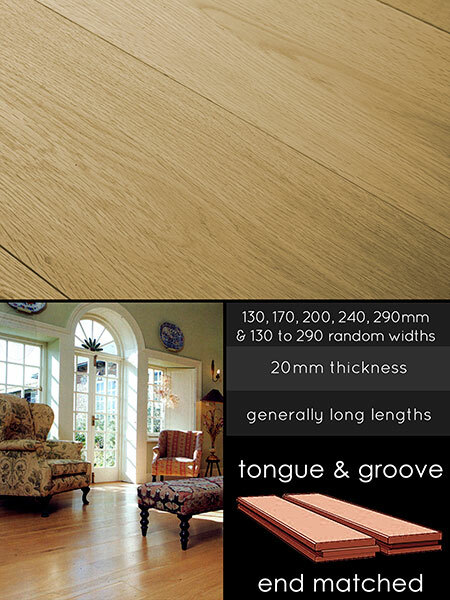 Our solid wood flooring is supplied kiln dried with tongue and grooves for quick and low wastage installation. The majority of our timber floor boards are supplied in long lengths and have stress reduction grooves on the back of the board for extra stability. * Very wide oak flooring. * Traditional on site installation. * Mostly very long lengths. * Rustic grade oak flooring. * Knots of various sizes to be expected. * Available in random widths. * 290mm width - special order.